St Joseph’s was one of the first Catholic parishes in the country to become a Livesimply parish. There are now at least a dozen, with more working towards it. The Livesimply Award recognizes the ways in which we try to make a difference in our local community and the world. The award reflects a commitment to live more simply and sustainably and to stand in solidarity with the world’s poor. 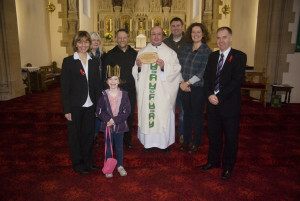 We were presented with a plaque commemorating our achievement during the Mass celebrating the Feast of Christ the King (2012). To apply for the award we had to take on three substantial actions under the headings of Living Simply, Living Sustainably and Living in Solidarity with People in Poverty, as well as at least six other supporting activities. More details about our actions are available here. 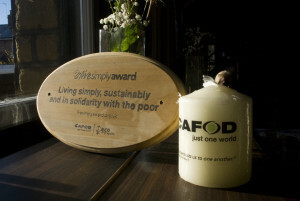 The award has been developed in partnership with CAFOD and Eco Congregation, to offer support and encouragement to communities to put their faith into action. Bishop Michael Campbell offered his support for the direction which the parish has taken, saying: “In this Year of Faith, you have demonstrated a tangible sign of your commitment to express your faith in an engaging and practical way. Of course, it is only the beginning of a journey for you all, as you demonstrate a clear response to Pope Paul VI’s call in Populorum Progressio upon all Catholics, all Christians, all people of goodwill, not to talk – but to act.